I started writing about Google Assistant before I’d even fully unpacked. The company had posted up a week-long residency with a profile to rival any in Vegas that first week of January. Celine Dion at Caesar’s, David Copperfield at the MGM Grand, Google at the Las Vegas Convention Center. The company wallpapered the Vegas monorail and plastered the words “Hey Google” on every rentable screen in town. Take that, Donny and Marie. 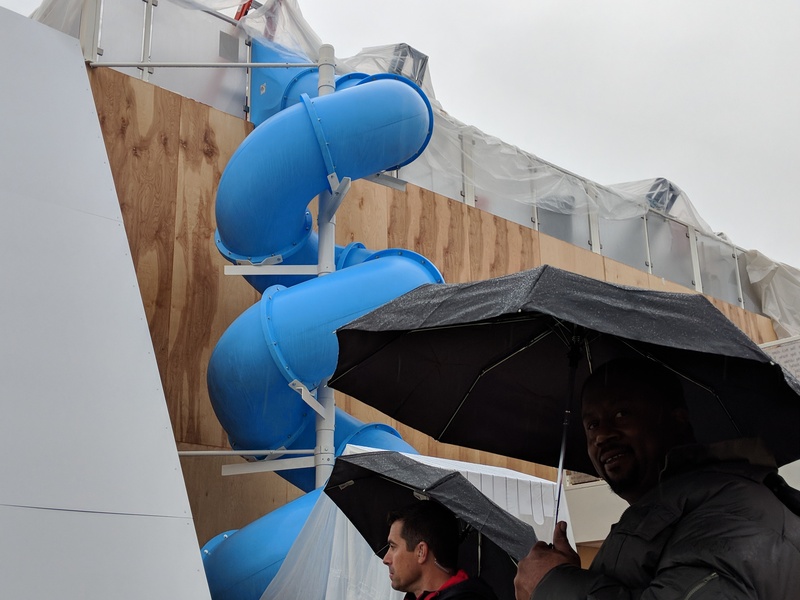 That crazy booth in the Convention Center parking lot seemed like a terrible idea on Tuesday when the rains opened up and swallowed it whole — but a day later, when the lights went out on CES for a few hours, everyone came running to Google and its free donuts. Our own booth at the Sands, meanwhile, where a number of us were posted up for much of the week, was way too close to the giant Google gumball machine. Every ten or so minutes, cheers erupted from the crowd as another eager tech industry type won a Home Mini, after dutifully waiting in line for an hour or so. And then, on my last night, when I thought I’d escaped the company’s presence for long enough to enjoy that Run The Jewels corporate gig, I walked out on the balcony of Brooklyn Bowl and spotted the same machine down below. The damn thing was everywhere. 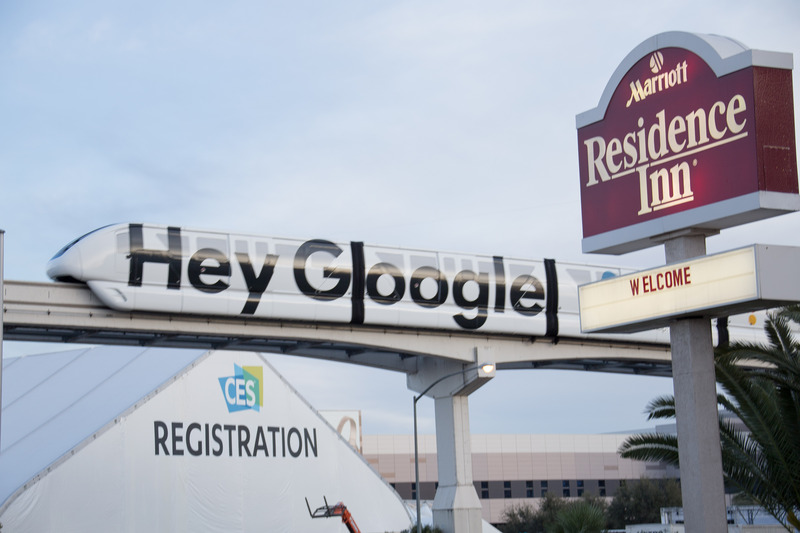 Google’s CES 2018 presence was an act of sheer brute force — a consumer electronics blitzkrieg that some how managed to standout among the bright lights of America’s most stupidly garish city. The fact of the matter is that, even if the company hadn’t followed through on that promise, it would still have managed to capture plenty of headlines. But Google delivered. After having virtually no presence at the show in past years, the company went from zero to 60. Practically no press conference or news release went by without some mention of Assistant. The company played its hand well at the show. There was no big Google press conference, and it didn’t release a single piece of its own hardware. Instead, it harnessed the platforms of its highest profile tech partners — Sony, LG, Lenovo, Huawei and the like. At the latter’s press conference, an executive even came out on stage to run down the specifics of Assistant — though to be fair, perhaps Huawei was simply filling time in the wake of some last minute adjustments. Assistant made it onto virtually every manner of hardware at the show, from TVs to refrigerators to electric bike wheels. And while the company went into the last holiday season with no direct competitor to the Echo Show, suddenly it had several, letting its hardware partners do all of the heavy lifting. From the looks of it, Amazon’s got something to be concerned about on that front — especially given the fact that the company went with the nuclear option a few months back, pulling YouTube from Amazon’s offering. Amazon had a good show, too, albeit with a decidedly more subdued presence. There was no giant gumball machine or armies of employees in matching outfits screaming until the voices went hoarse, but the company handily sent along a list of Alexa announcements at the end of each show day. And the list is a solid one, particularly with the planned launch of Alexa on several Windows 10 PC — effectively eating into Cortana’s one stronghold. Both companies’ respective assistants had a successful CES, but Google’s list of devices go a long way toward shrinking the gap between the two players — and take it even closer to its dream of device ubiquity. That positioning, coupled with the years of backend development that have coalesced behind Assistant should leave Amazon more than a little concerned about holding onto its place at the top of the heap.